Ace Cafe London is at the heart of defining a culture that is based on a ethos, with a rich heritage, born of the street. This glorious 132 pages, copiously illustrated, gloss finished and perfect-bound bookazine celebrates all that is identified with the worldwide appeal of Britain’s most historic roadside cafe, the meeting place that is a destination! 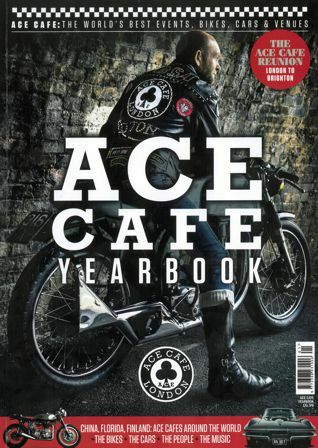 From hight-speed thrills to the birth of an entire culture, the Ace Cafe Yearbook takes us from the ton-up boys getting their speed kicks on the road, the Mods versus Rockers, right through to the present day with people and machines that are the Ace today. It’s a must read for all!